That's right; on a regular basis I drag an insanely sharp piece of steel across my face and throat, and live to tell the tale. 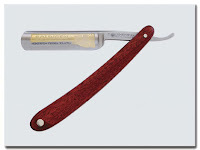 I decided I'd had it with the razor burn and outrageously expensive cost of replaceable-blade "shaving systems" (i.e., razor company cash cows). So, I decided to invest in an instrument that a) gives me a much closer, much more comfortable shave, b) will never need replacing and c) connects me with a long line of manly men stretching way back into history who've opted for skill and technique over machinery and "convenience." Face it: if you're still using a disposable razor or (God forbid) an electric...I'm better than you. what kind of shaving cream do you use with your hot razor? Sebastian's step -father is on a similar quest. If you click on the title of this post, it will take you to the C&E soap I'm currently using. I've also heard great things about George F. Trumper products, but haven't tried them myself. More important than the soap, though, is having a good quality, genuine badger-hair shaving brush. It makes all the difference in building a good lather.